The term cybersecurity is commonly associated with the protection of digital data from theft or compromise by hackers. For enterprise customers, however, most data breaches aren’t the result of technology villains inventing new ways to do damage. Instead, breaches are due to shortfalls in the development and enforcement of stringent security processes and protocols. This is why a good cybersecurity plan starts with a ground-up approach, including not only the technology and virtual security in place, but also very stringent physical security, backed by rigorously tested procedures and clearly defined business protocols. The reality is that effective cybersecurity requires more than just a secure infrastructure and one-time installation of security processes. Cybersecurity requires ongoing attention to, and adjustment of, operational protocols and facilities management. Sound complicated? It’s really not. By relying on a top-tier data center provider, businesses can focus on delivering on the promise to their own customers, confident that best-in-class compliance practices are being employed in the following key areas beyond the physical infrastructure itself. 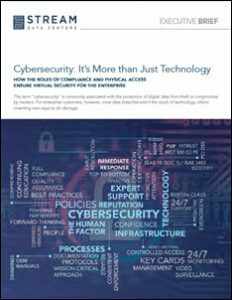 Download the new white paper from Stream Data Centers that explores how the roles of compliance and physical access ensure virtual security for the enterprise.